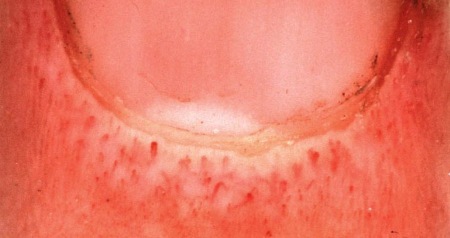 Can you see the little blood vessels in the proximal nailfold in the picture above? 'Nailfold plexus' visibility is primarily used to assess rheumatological disease (such as scleroderma), but it can also signal schizophrenia. NOTICE: science has described quite a few other parallels between rheumatology diseases & schizophrenia. A high level of nailfold plexus visibility (NPV) is rare in the general population (occurring in 3-7% of healthy adults) - the rate of high NPV ranges from 20-70% in populations with schizophrenia. But the variant of 'giant papillaries' is actually very rare (close to 0%) in the general population, while it is a common characteristic (40%) seen in scleroderma! There is a wide range of hand characteristics which discriminates scleroderma from schizophrenia. One of the typical differences is that sceroderma is featured with various skin conditions + finger conditions - e.g.Raynaud's phenomenon is also quite common (up to 20%). While schizophrenia typically manifests with a broad range of minor abnormalities various mobility problems - including e.g. : mobility problems combined with uncommon hand lines + various inborn dermatoglyphics. - Schizophrenia: the language of the hands! Re: NAILFOLD PAPILLARY VISIBILITY - How to discriminate scleroderma vs schizophrenia?